Eleven-year-old Ellary Kinnane came all the way to South Florida from Rhode Island to soak up the sun on Miami Beach. Ellary has a rare condition called nemaline myopathy, a disorder that primarily affects skeletal muscles, according to the U.S. National Library of Medicine. The muscle weakness has Ellary confined to a wheelchair. She also needs assistance for breathing. But those restrictions didn’t stop Ellary – and several boys and girls just like her – from enjoying a day at the beach Monday. It’s all thanks to the Ventilation Assisted Children’s Center, or VACC Camp. The camp, which has hosted more than 250 families during its 32 years, is hosted by Nicklaus Children’s Hospital. The week-long overnight camp caters to ventilation assisted children, offering programs and activities that aren’t normally available to technology dependent children, according to the website. The camp’s programs include swimming, field trips to local attractions, games and “free play” that aims to promote growth, development and social skills, the website said. Families and kids venture from all over the United States and even internationally to take part in the camp. 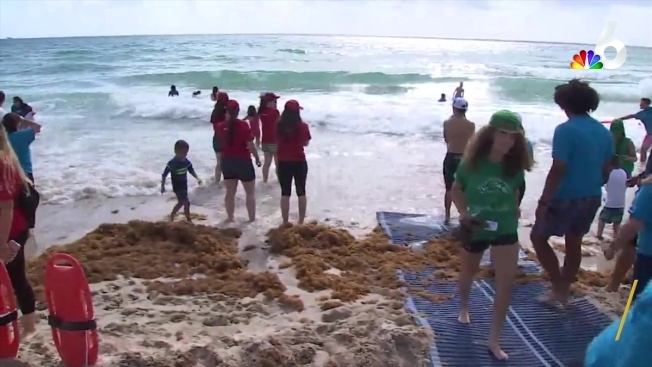 Miami Beach Fire Rescue participated in the event, setting up wheelchair paths along the beach for the children. “It’s the best day of the year for me in my department life,” said Lt. Victor White. “Ever since I got involved in this I know it’s going to put a smile on my face." The experience is provided at no cost to the families and is supported by generous donations made to Nicklaus Children’s Hospital. “For her to be with other kids like her and to do everything…that’s the main thing,” said Trey Kinnane, Ellary’s dad.